Deep breathing is a simple and efficient way to reduce your stress levels and regain control in your mind. When you start feeling overwhelmed at work or in any other environment, sit down and take a few deep and conscious breaths. Breath in until you feel your diaphragm expand and then slowly let out your breath. You can focus on breathing by slowly counting to five or ten while you take a breath in and then counting to five or ten while you exhale. Make sure you focus on breathing your with diaphragm. You should feel your stomach move rather than your shoulders to take in a deep breath. Try to take in five to ten deep breaths before you return to the task that feels overwhelming. You will find that the slight interruption and focus on breathing actually gives you the chance to step away from the project or task for a moment and regain a feeling of balance. You can then focus on the task without feeling overwhelmed. Meditation is not necessarily a time consuming exercise, but it has a wealth of benefits for your mental health. When you have limited time and you want to clear your mind, take a few minutes to meditate at your desk. Close the door and use a meditation phone app to work your way through breathing exercises that help you regain your focus. If you cannot use an app for the meditation, then sit down and take a few calming breaths. You can focus on an object on your desk or you can close your eyes and turn your focus inward. Give yourself a few minutes to allow thoughts to move through your mind without acting on them. It is not necessary to avoid thinking; instead, you want to allow your mind to let go of the thoughts until you feel relaxed and calm. When you work in an office environment, you may have a limited opportunity to move and exercise through your day. That can raise concerns about your physical and mental health because it makes you feel trapped, annoyed or cuts into your focus. A simple way to cut through the challenge of staying focused throughout your day is simply standing up and stretching on a regular basis. Ideally, you want to stand up every half hour or 15 minutes for a short time period. The stretching will keep your circulation moving and standing breaks up the monotony of your day. If you have time for a short walk, then take a short walk through your office. Get a glass of water or take a trip to the restroom before returning to your desk. The movement reduces the tension that develops when you stay in one position for an extended period. It is not always possible to socialize at work, but you do want to take a few minutes to engage with others throughout your day. Social interaction is a key part of your mental health. Since humans are naturally social, you do not want to pull away from others when focusing on a project or working on a task. Instead, greet your co-workers in the morning and take a few minutes to talk during your breaks. Interact and engage with others when you have a few minutes. You may discover that others give you insights that you previously overlooked or simply give you a new perspective that helps you overcome challenges in your projects. Social interaction also improves your mood and helps you stay on track. Even when the interaction does not help with a specific task, it does give you a positive and optimistic outlook that helps you focus. Ideally, you want to focus on classical and soft music that gives you a relaxed feeling. If you do not enjoy the music, then try for upbeat and positive songs that have a clear structure and melody that is familiar. Avoid new songs or music without clear structure, since it may interfere with your focus. 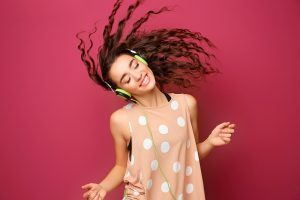 The best music to improve your mood and help with your mental health is a slow song with a familiar melody that makes you feel relaxed. Laughter is a powerful way to instantly boost your mood. When you laugh or smile, it makes you feel happy and energetic. Even when you fake a smile or laugh, it has a positive impact on your mood and mindset. When you feel stressed at work or overwhelmed in your life, take a moment to laugh. Put on a funny comedy or ask friends out for a night of joking and laughing. Spend time with loved ones who make you laugh with their activities, antics or behavior. When you laugh, it reduces your stress levels and makes you feel optimistic and positive. Setting a goal gives you a focus, but it can also cause stress when it is not attainable. Focus on setting realistic goals that give you enough time to accomplish a task. Ideally, you want a clear path that has a timeline you can accomplish, but not so much time that it allows you to procrastinate. For example, if you know that a task needs at least one week, then give yourself a week and do not set a goal of finishing the task in three days. Set realistic goals you can accomplish. Living in a modern world means taking time to address the high-stress lifestyle associated with a career, family and other activities. By taking a few minutes throughout your day to focus on your mental health, you make positive changes that keep your stress levels under control and help you accomplish your goals.